The EZkeys software includes an extensive and pro-played MIDI library, compatible with any EZkeys sound library. The MIDI covers all major styles from Pop, Rock and Gospel to Country and Jazz. This coupled with EZkeys’ revolutionary SMART TRANSPOSE functionality, writing songs has never been easier. Drag and drop MIDI, add color and transpose included or you own imported MIDI on the fly – the sky is the limit! 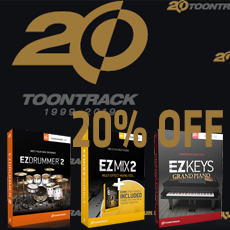 If you have registered at least one EZkeys Instrument already, you are eligible for the reduced "EZkeys Sound Expansion" to get the Pipe Organ and save big!